K2 and K4 Citralysat | ARKRAY, Inc.
K2 and K4 Citralysat is a dialysate solution for continuous venous to venous hemodialysis(CVVHD) with citrate-anticoagulation using the anticoagulation solution of 4% trisodium citrate with parallel taking of calcium. The fluid may be used in devices for the continuous hemodialysis equipped in the citrate-anticoagulation module and pumps for citrate and calcium infusion apart from the standard pumps used for blood, dialysate solution, and filtrate flow. K2 and K4 Citralysat are delivered in 5-litre double-chamber bags. 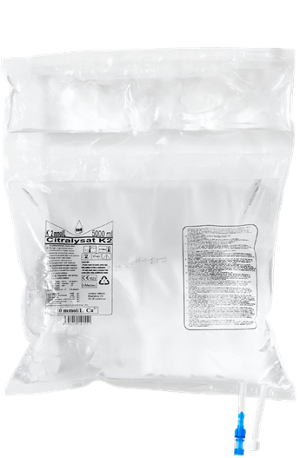 THe dialysate solution for immediate use is prepared by mixing the content of both chambers of the bag directly before use.